Left: My friend and her student, Pratap Simha Prasad, from B'lore(JP Nagar). Right:With Post Doc.Dr.Donglin Hu and his family. 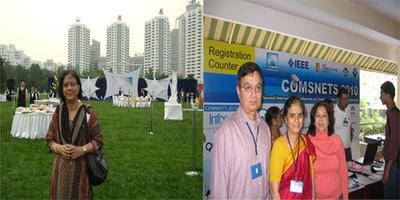 Left:Attending an International Comunications Conference reception, in Beijing.Right:At the IEEE conference in Bangalore with Dr Tugnait and his wife Shobha. 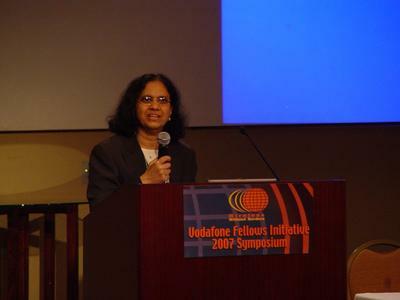 Addressing a gathering at a symposium. 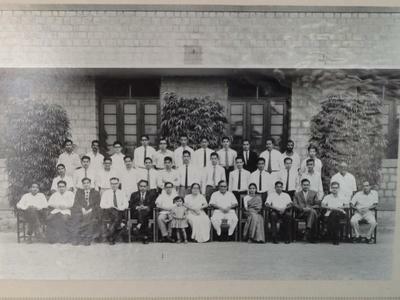 As a student at IISc., in the first row, fifth from left. That, which we call a rose, by any other name would smell as sweet! What’s in a name is a question, which elicits many answers, as long as we are discussing about it generally, and not our own in particular. According to the Hindu tradition, a ten-day old child is given a name at an auspicious time and is observed as a ceremony. Earlier a child used to get three names; one was that of an ancestor, second that of the family deity and the third was supposedly the transactional name- by which it would be referred to by family and friends. Parents choose the name, as per the star the child is born in, or the profession, which the family is pursuing, or the cast or community, which the child belongs to. These names were abbreviated and prefixed or suffixed to the personal name. These abbreviations were either a blessing or a bane. While pondering about this, my memories ran amuck, landing on my school days and on a friend of mine. We had many things in common- our residential area, childhood friends, our mother tongue, etcetera. We sat on the same bench in the classroom. Our names started from the same alphabet ‘P’. During school days and later too, I knew that she had an affinity to ‘A’. Sometimes she wished that her name had started with ‘A’, so that it was first in the class register. That was probably the one unfulfilled wish of hers. She was brilliant. She was always getting ‘A’ grade in all the examinations. Her name took the most coveted place in the results list. She invariably got accolades for her academic excellence. I, on the contrary, was drawn more to ‘D’. Dance, debate and drama and thereby invariably getting ‘D’ grades. Promoted to the next class and thankfully not degraded. Despite the difference in grades, we were friends in and out of our classrooms. As teenagers we studied in the same Alma Mater, ate together in the canteen, were trained in the same institute, I for six months and she for six summers. I recall that when she was earnestly learning the Mendeleev periodic table of chemical elements, I was busy learning the elements of dramatics and debating, to go periodically on stage to represent my institution. When she was collecting her scholastic records, I was collecting participation certificates in inter-collegiate competitions. Time rolled by. Destiny had planned different destinations for us. My destiny took me to my favorite “D” -Deutschland for a short professional stint and brought me back home for good. “D” was a pleasant transit station for me in my life. Her destiny or should I say her determination lead her to America to pursue her academic path. Was she still hanging on to her favorite letter ‘A’? Nevertheless her stay there stretched longer and longer and Bangalore turned into a transit place for her. The special times we had shared for so many years disappeared into oblivion, as time and place toyed with our lives. I was moving in the proverbial much trodden path, like a horse with an eye patch; I had no clue about what my friend was doing in another part of the globe, far away. Almost after three decades, she called me up and expressed a desire to meet me. I could not believe my ears. I pinched myself. It hurt. So it was true! My joy knew no bounds. I could meet my childhood friend again. I invited her home. During the brief lunch, I spoke about myself, the name I had made in my teaching profession, my family, my children and the fame they were enjoying in their circles. She listened to my bragging without ragging, only saying ‘really’, ‘how nice’ etc. and she enjoyed the simple but tasty food. Soon she had to say adieu. I could have her over only for a cup of tea. My husband joined us and while sipping tea, we chatted and came to know that, we had a couple of common friends too, living near and far. A couple of names that appeared in our conversations were Dasharathi and Ramakrishna with whom she had studied and worked with. We had hardly finished our tea, her pick up car arrived. It was time for her to take leave of us, before we could even warm up. She thanked us profusely for the hot cup of tea and left for another part of the city. One Sunday morning, Ramakrishna, sprang a surprise visit on us. During his tenure Mr. Ramakrishna had built up the Central Research Laboratory as a technology force to reckon with in many national projects mainly in defence. When we spoke about our friend, he gave us a lot of information about her life in America. Coincidentally the alphabet “A” was bouncing back, time and again, in his conversation with us. She had found a life partner whose name started with A. She lived in a country, which started with A. She had worked for a long time in AT & T BELL laboratory, before she moved on to Auburn University, Alabama. She procured the prestigious Alumni Award from the IISc. I was no longer listening to him; I fell into a reverie. She and I had shared so many things. What happened to us with the passage of time? While I was caught in the web of work at home and at my work place, she was busy developing the WWW. When I was attempting to attract participants in the regional meetings verbally, she attracted others by her erudite presentations in the international meets, cerebrally. I was turning to Speaking Tree and satsanghs to replace material desires with noble thoughts; she was interacting with Nobel laureates in BELL Labs. When I was being introduced to unisex saloons in my city, she was introducing the inventor of Unix to her colleagues in her city. Unix, I was told, was the first free software made available and many Indians benefitted from it. She had become a torchbearer for the Very Large Scale Integrated Circuits (VLSI). Ramakrishna, interrupted my thought circuit. He told us about her contribution to the area of “Digital Signal Processing Hardware” and that her name and photo stand as testimony for her achievement in the “Hall of Fame” at the BELL Laboratory in the US of A. Our guest had saved the best for the last. He told us that IEEE had elected her as the First Lady Fellow. WOW! What is there for me to share with her now? Only the past? The carefree days of our childhood when we were busy playing hopscotch in front of our house? The celluloid dreams of our teenage years, skipping lectures to go for a movie? Yes?? No, NO!! In fact now I have a lot more to share about her. Today as I recall all these events, I shed tears of joy, and my heart swells with pride. I wish to share her achievements with others. Honestly, her modesty despite the milestones she has achieved in her field stuns me to silence. What’s in a name? Everything is! Her name has attracted people all over the world. She has made India proud. She has made me proud. Many may wish that they had her name and fame. Prathima Agrawal, YOU ARE AWESOME. YOU ARE AMAZING! A garden with roses like my friend, Prathima. Comments for What's in a Name? Very good article! Sustains interest till the end. As always - like d way that our thoughts sway to upon reading from your memories! If a person is good, his name sounds wonderful and the reverse is also true. At times,we brag because of our inferiority complex. Generally, true achievers never speak about themselves. They are beyond everything. Quite an engrossing article. And you continue in your charactetistic style (truly what is your strength)...with the large heartedness to appreciate the achievements of others with grace and sincerity! Beautifully written article! Kudos mom! Life takes all of us on a unique journey...some of us may garner more accolades than others along the way but I value more the lessons I have learnt along the way! Am glad I have you as a guide on this journey! Thanks a lot for your comments! I keenly observe the journey my near and dear ones make in their lives and learn about the strides they have made in their chosen path, ( provided they are willing to share with me), to gain from their experiences, a wealth of information. Thank you once again for your positive reactions. Lovely article, yet again. Thoroughly enjoyed reading it, best wishes.